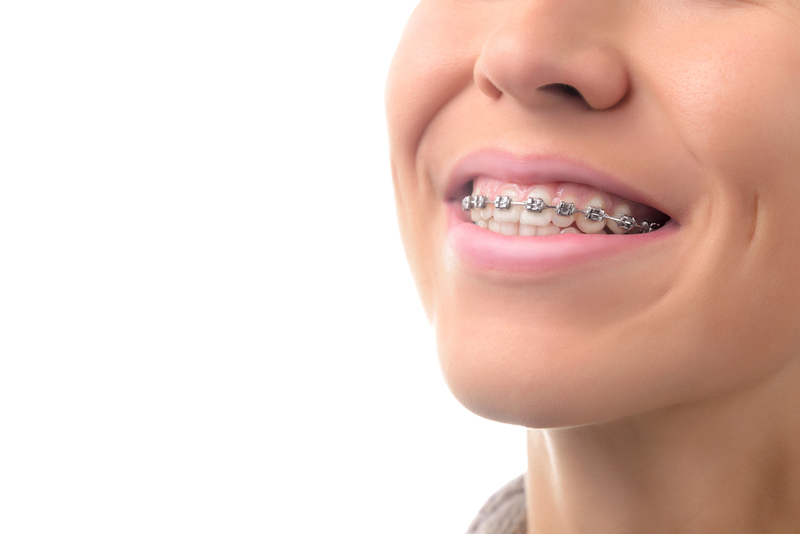 How do you know when you need braces? Do you know? When you look in the mirror at your smile, do you like what you see? Are your teeth straight or crooked? Is your bite comfortable? Do any of your teeth collide when you bite, swallow or chew? Sometimes it is easy to spot signs that you may need orthodontic treatment, and at other times the signs might not be readily apparent. At Belmar Orthodontics, we work with you and your general dentist to determine the best course for your oral health needs. Learning what signs to look out for that could indicate that orthodontic treatment is needed can help you keep your mouth healthy and your smile bright. One of the most obvious signs that you need braces is needed is overcrowded teeth. Teeth that are overcrowded don’t just pose a cosmetic problem, but can pose real health threats to you. This is because food is more easily trapped in crowded teeth and harder to remove with regular teeth-cleaning methods. Trapped food leads to tooth decay, gingivitis, periodontal disease, bad breath, and can negatively affect self-esteem. Gaps in between teeth often indicate that the upper and lower jaw are not fitting together properly, a condition commonly referred to as malocclusion. Genetics, thumb-sucking, mouth tissue formation, and other conditions can also cause gaps between the teeth. Closing these gaps not only helps to improve the aesthetics of your smile, but it also can help to fix your malocclusion problems. Gaps between teeth also leave the gum tissue between the teeth exposed and at more risk for being affected by plaque, inflammation and infection. You need braces to help close these gaps. When we refer to your “bite” we are referring to how your upper teeth and lower teeth meet and interact when your mouth is closed. 70 percent of the population has a malocclusion problem–incorrect bite–but this is not a condition that one should ignore. Improper bite can cause irregular wear of your teeth, jaw issues (TMJ pain) and chronic headaches. Malocclusion can also result in injury to your teeth as they improperly collide with one another as you chew or speak. Proper speech development can also be impeded when your bite isn’t functioning properly. Orthodontic treatment improves the function of your smile, and the appearance, benefiting you in numerous ways. Jaw pain and headaches are often the result of a misaligned bite. When your jaw is not fitting together properly it can slip out of place easily, causing tension when you are sleeping. Jaw pain can also result from a condition called TMJ disorder. TMJ, or temporomandibular joint disorder, involves your body’s temporomandibular joint (TMJ) which connects your jawbone to your skull much like a sliding hinge. When the hinge mechanism that connects the upper and lower jaw isn’t working you can experience pain in your jaw joint and in the muscles that control jaw movement. Temporomandibular Disorder (TMD) refers to a variety of conditions that affect TM joints, jaw muscles and facial nerves. During your consultation with Dr. Hardy he can evaluate your teeth and jaw alignment to see if your jaw pain is a result of poor alignment and determine if you need braces. Severe cases of malocclusion can affect the way you chew, speak and swallow. Do you–or your child–find yourself biting your cheek or the roof of your mouth when you are chewing? Do your teeth ever collide when you chew sending jarring sensations through your whole face and/or jaw? Do you (or your child) have problems with slurred speech, or saying certain words? If you answered yes to any of these questions, chances are that you need braces. All of these issues can be the result of a bite that is misaligned. Once you correct the jaw alignment, these symptoms correct themselves, but they won’t correct on their own! What Caused Me to Need Braces? One of the most common questions that we are asked is, “What caused my teeth to be crooked? Or, “What caused my jaw not to be aligned correctly? Unfortunately, we don’t always know the exact cause, but most orthodontic issues are genetic; you inherited those space or bite problems! Other issues develop overtime due to: thumb- or finger-sucking, dental decay, mouth breathing, injuries, or poor nutrition. The good news is, regardless of the cause, Belmar Orthodontics in Lakewood can correct your teeth/bite problems and restore your proper functionality with a beautiful smile! If you have seen one or some of these signs that you may need braces, give us a call! Life with braces brings exciting changes, and sometimes some challenging adjustments too, but the end result is a healthier you! Belmar Orthodontics can help you obtain a healthy, functional, attractive smile. If you think you need braces, our online patient education can help answer any questions you may have, and our friendly staff is always available to help. Call 303.225.9016 today to learn more about braces or to schedule an appointment. Dr. Hardy is committed to your care and will help you reach your smile goals as quickly and efficiently as possible if you need braces.